I remember the first time I ever caught anything with my Dad, and it was on a silvery lake in Pennsylvania, and it was a turtle, of all things! 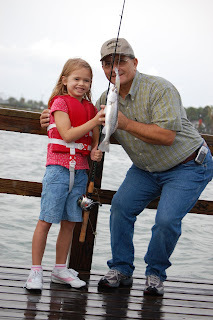 For Amaleah, her first catch was a speckled trout, and my Dad was there next to her to see her through too! This time it was salt-water fishing, which I don't think my Dad and I have ever experienced together before. Unfortunately, this particular weekend on the gulf coast of Texas, the hurricane rains persisted, and there wasn't a dry day at all to fish. So finally we had to just make the best of it and get a little wet for this memorable experience. I'm glad we did! It's so fun to see your children doing their firsts, and as they keep getting older, there are always new "firsts!" I cherish these moments as they come. In other news, Landis is taking his "first" steps...thus, I'm not blogging much.